Is the high level of Government debt a justification for austerity? Government debt was, in 2010 and 2015, a key element in the general election. The high level of debt is the justification for austerity. Politicians on the right and left have explained that the high cost of servicing the debt prevent spending on health, education and other areas. The natural assumption is that this has been such a key issue in 2010 and 2015 because the cost of interest payments on the debts were particular high in those years. An analysis of government statistics reveals that the opposite is the case. The cost of interest payments were, proportionately, at their lowest levels since the war in the years 2010 and 2015. There are two ways of comparing the cost of interest payments: as a percentage of overall government spending or a percentage of UK GDP. Interest payments were 4.3% of government spending in 2010 and 4.9% in 2015. As the graph below shows, the level was higher in all other post-war years. At the end of the previous Conservative government, in 1997, interest payments represented 9.7% of government spending. A key reason for the low cost of interest payments is clearly the low interest rates at which money can currently be borrowed. However, as many economists have pointed out, the low interest rates make this the best time since the war to invest in the public infrastructure rather than cut back. And if the main problem with debt is the cost of servicing it, why has this only become an issue when that cost is at a post-war low? “Labour should be proud that when we were last in government we ran a budget surplus for four years and achieved some of the lowest deficits both in UK history and in comparison to other economically developed nations. There is nothing progressive about budget deficits. Every pound we spend on debt interest is one less we can spend on the NHS, on vital public services, on helping the poor and vulnerable. It seems from this, that Chris Evans is in urgent need of an economics lesson for dummies. * His statement shows dire ignorance of how the State finances and money system works. He claims that there is nothing progressive about budget deficits and lauds the fact that Labour ran a budget surplus for four years whilst achieving some of the lowest deficits in UK history. So is this something we can be proud of and does it fit with any sort of reality? I would suggest that politicians should actually take some time out to learn about how our economy really works before they make such assertions. Firstly a short lesson in deficits and surpluses. Government deficits sound bad, don’t they, when we are told that they are like of our own household accounts? Going into the red is something we avoid if possible – the consequences of doing so as a private individual or company could be ruinous. However we have been conned by the language used to describe our economy which equates it to a household budget and suggests that going into debt risks bankruptcy. Nothing could be further from the truth. A sovereign country issuing its own currency cannot go bankrupt unless we live in the Eurozone, a country like Greece, which does not control its own currency issue. Equally, if a government aims to reduce the deficit it will take money out of the economy in the same way as going into ‘surplus’ does. It’s back to front to our understanding in terms of our own personal income/expenditure/savings. Firstly, taxation is not income or revenue as we are told since a government which issues its own currency is not constrained by its tax take assuming it has idle resources available. A ‘budget deficit’ represents the money spent into the economy and is the way a government can add aggregate demand and influence output and employment levels. Whilst there is unused productive capacity the actual ‘budget deficit’ is of no relevance. The only legitimate goal that any government should pursue is the real goals of employment and output. In fact budget deficits are simply the mirror image of non-government savings. Government spending represents all those things we take for granted which make our country a better place to live and work. The word ‘surplus’ is equally misleading as it implies savings. A ‘budget surplus’ does not represent national savings at all. Households save to increase their capacity to spend in the future. But a government cannot save in its own currency. It does not apply to the issuer of the currency who can spend at any time it chooses. It seems that like many politicians, Chris Evans simply has no idea of how the macro economy actually works. They, like many of us, have been taken in by decades of neoliberal economic thought which declares categorically that deficits are bad and balanced budgets and surpluses are good. In truth they are neither good nor bad and are dependent on economic circumstances – the state of the economy, the trade account and the level of private debt. The budget surplus of which Chris Evans is so proud was made possible by sky rocketing household debt. ‘the ignorance of this politician on the fact that government surpluses mean non-government deficits, and that countries without trade surpluses cannot run budget surpluses for long without a private debt explosion and growing financial fragility is beyond worrying. It is pure ignorance’. Boom and bust had been abolished so said Gordon Brown as he put his faith in financial deregulation to facilitate an economic miracle which, in reality, actually encouraged household debt and asset bubbles. It gave all the appearance of a growing economy when in fact it was built on sand. Financial speculation replaced the solid foundations of a real economy which should be concerned with investing in the well-being of a country’s citizens and the protection of our natural environment. So let’s get it right Mr Evans and all those who abstained from the Fiscal Charter vote it’s nothing to be proud of at all. John McDonnell’s decision, if a little late, was the right one to make and let’s hope that the real story of how our economy actually works will start to see the light of day sooner rather than later. * Unfortunately Chris Evans is not the only MP in need of a lesson in economics. We, by which I mean the Western world and further, have gone through over five years of the worst financial crisis since before World War II, so we are told. The crisis has been cynically blamed on widescale ‘over-spending’ on welfare, accusations of public sector self-indulgence that I and many others have debunked elsewhere. In truth, the damage was done by ridiculous risk-taking in the financial services sector, chiefly in the United States of America, but by no means limited to there. But irrespective of whose fault it is that the financial crisis happened, the simple fact is that it is still here, and one of the consequences for the UK was that the last Labour Government, headed up by Gordon Brown, chose to hand the banks a series of enormous bail-outs of public money to prevent the whole financial system collapsing. 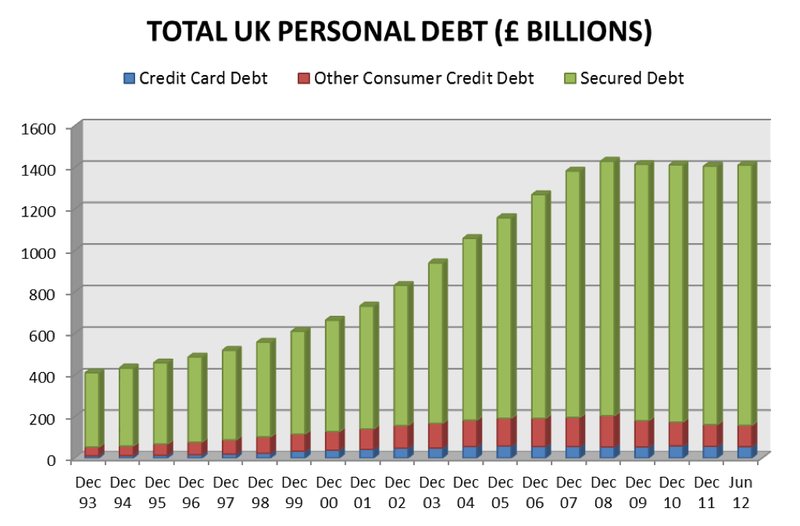 This more or less quadrupled the National Debt owed by the British Public Sector in the blinking of an eye. The exact debt the country owes depends very much on which calculation, and indeed which definition, you use. By the kindest calculation i.e. the one that leaves out all private sector debts, including ones that have public sector overlaps, the country owes roughly £1.4 trillion. By other, more realistic calculations, it is somewhere between £5 trillion and £6 trillion. Since the present Coalition Government came to power, it has been in the grip of what seems a frenzied obsession with paying down the National Debt as the only way it can think of to end the crisis. To do this, it thinks it would need to dismantle the structural Deficit i.e. put a complete stop to the amount it has to borrow each year to meet its spending commitments. This is not quite the case though. While there is no doubt that the National Debt is too high – it damages the country’s credit rating and also can put an unhappy strain on international relations – it is certainly not the out-of-control runaway locomotive that the Government seems convinced it is. Indeed, it’s not exactly a problem. It contains an absurdity, for sure, and one day it might well evolve into a real problem, should economies in certain other countries collapse, but as things stand, it really is not a big deal at all. The National Public Sector Debt is largely just the sum total credit belonging to non-Government agencies (which we shall call ‘the creditors’, although a lot of them are exporters instead) in deposit accounts within the Bank Of England. What happens is that, when the UK Government purchases goods or services from a foreign country, it sets up a deposit account (yes, just like the sort of deposit account you get in a regular High Street Bank) within the Bank Of England in the creditor’s name, and credits that account for the full cost of the goods purchased. Whilst the money is in the deposit account, it can’t be used for purchasing anything (again, just like in a normal High Street Bank deposit account), but it receives a high rate of interest. This account is sometimes called a ‘Gilt’, a ‘Bond’, or a ‘Security’. Now, when the deposit account ‘matures’ i.e. reaches the date when it needs to be paid back, all the Government has to do is to transfer the whole sum into a current account in the creditor’s name, again within the Bank Of England. (Yes, yet again it works in exactly the same way as a current account on the High Street; low interest rates, if any, but the sums can now be used for making payments.) Then the Government simply has to forward credit notes for the total to the creditor. That credit note will allow the creditor to claim any British goods available for sale up to that total, without having to pay any money for them. Once that total is off the creditor’s deposit account and into the current account, the debt is officially paid off. That’s all that most of the National Debt really is, just a combined total of credit notes that haven’t been printed yet, because the respective deposits haven’t matured. As soon as one of these credit notes is printed, its sum is no longer part of the Public Sector Debt. And that’s it. That’s all that happens. This is happening with trade deal after trade deal every single day. But new deals are also being struck every single day, which is one of the reasons why the Debt never seems to go down. And the most important point, before anyone asks, is this; no, the credit notes cannot be cashed in by the creditors. The creditors cannot demand money in their place, or that they be paid off in gold, or some-such; the pound-sterling is not signed up to the gold-standard, it is a non-convertible currency. The upshot of this is that the British Government doesn’t have to send its creditors any actual money. All it has to do is just give a guarantee to let the creditors claim British-owned sales goods to the value of the amount owed – in other words, it has to give them the credit notes. What the creditor chooses to do with a credit note once received is really up to him. He can leave it in limbo, he can use it to open another deposit account within the Bank Of England to increase the interest further, he can genuinely use it to claim sales goods (in the unlikely event that he can find any available on the British market worth having), or he can even trade it to someone else. But those are pretty much the only options the creditor will have. There is near enough nothing that he can do to get the money itself. There is a point of bad honour in this, in that the UK has effectively taken vast quantities of goods from countless trading partners without really paying for them (“What else is new?” cries most of the Commonwealth). But looked at in purely practical terms, there is no real need, as things presently stand, for the UK to pay off the National Debt at all. The creditors would have known the risks when they sold their goods to the UK (and indeed to other countries) in the first place – that they were never going to receive any actual money for the goods, only credit to their agreed value that they could eventually purchase British-owned market goods with in return. Such a trade is merely an exchange-in-waiting. From the moment the value of the sum is transferred to a Bank Of England current account, the creditor can use it to make purchases on the British market, therefore he has received the ‘purchasing power’ the deal entitles him to as though the credit were real money, so the debt is classed as ‘paid off’. Even if the creditors find there is never anything on the British market that they wish to buy, there is every possibility that at least some of them will continue trading with the UK, depending mainly on which country he is from. For instance, countries that are ‘export-driven’ (see below), such as China, are more or less compelled to keep selling to the UK – and yes, even more so to the USA – even though there is seldom anything they can do with the credits they receive. This is because if they do not keep exporting, their own economies will collapse; they will only have their own markets to sell to (and maybe a few countries with much smaller markets of their own), but if they have little or no internal demand because of inadequate pay-rates among the general population, which is usually the case, most of their goods will go unsold, and the industries will have to stop retailing or producing, causing surges in unemployment. This is why the Chinese Government currently holds an ever-growing mountain of over $2 trillion at the US Federal Reserve, and hardly ever uses any of it – because it needs to keep exporting to the US to keep its heavy-manufacturing base turning over, but can hardly ever find anything it can use from the US markets to take back in return. Because Britain has little native manufacturing industry, it has to keep importing, as it would struggle to meet its population’s own needs if imports stopped. (This is quite different from the position of the USA, which still has a large native industrial base that can ‘kick in’ very quickly if necessary.) So for the sake of trading relationships, it would be best for the UK if it can get the Debt down quite substantially in real terms – say by going back to manufacturing goods again that creditors would actually want to buy – especially in case circumstances in exporting countries were to change. Say the Chinese economy didcollapse, then the British would have to look elsewhere for many of the imports it needs. Not all prospective trading partners will be ‘export-driven’ in the same way as China, in which case the bad real-terms record of the UK as a trading partner would come back to haunt the negotiations – the new prospective exporter might say, “You people never produce anything that I would want to buy, so what use are your credit notes going to be to me? Pay me in dollars or euros, or something!” But one way or another, this has almost nothing to do with the methods the Coalition Government are trying to employ to reduce the Debt anyway. The Public Sector Debt is not really a crisis after all, and it’s not even an issue to any great extent, at least not yet, and it won’t be until a major export partner collapses. But the problem is that nobody in Parliament seems to be aware of how the National Debt really works, of how little pressure there really is to pay it off, or of how simply (and automatically) it is paid. All they do is see the huge numbers involved, nearly have a heart attack, and respond by taking a hatchet to necessary services in order to cut costs. In-so-doing, they cause economic slowdowns that reduce tax yields and so make the borrowing requirement grow even bigger. The Government’s whole approach is quite pointless, and it has caused much needless suffering for many people, to no achievable end. We are still lumbered with a crisis that is in large part a phantom, even though its effects are very real. That the crisis is ongoing after half a decade is a testament, not to national self-indulgence, but to national self-harm. “…in the years of plenty they put nothing aside. They didn’t fix the roof when the sun was shining”. For the last 4 years you will have seen or heard quotes like this in the media. How we were on the brink of bankruptcy and how “there is no money left”. Those advocating a “Keynesian” response to the current crisis are rebuffed with the argument that we cannot increase borrowing now because we didn’t run budget surpluses in the years before the crisis – “Gordon Brown spent all the money”. Keynesianism has now been reduced to “surpluses in the good times, deficits in the bad”. Liam Byrne’s famous note left as Labour left office was particularly heinous and the Coalition never miss an opportunity to use it as a stick with which to beat Labour. It may surprise you to hear this, but Liam Byrne is not an expert on the economy (or anything else), and should be ignored on all matters economic. The Government say Labour want to increase borrowing by £200bn, and this would be disastrous as, if the ‘markets’ thought we were increasing borrowing, they would start to worry that we would be unable to repay our debt (or “pay our way in the world” as David Cameron is fond of saying), and interest rates would start to rise. This is basically what has happened in some of the states in the Eurozone, and Coalition ministers have not been shy in pointing this out (repeatedly and at length). Currently, Labour have no coherent response to this. But is there any truth to this narrative? Is there an alternative path? So the idea that budgets must be balanced is a myth. Samuelson believed this myth was necessary to place a leash of governments who might be tempted to spend, spend, spend, but a myth it is never the less. But why is it a myth? Aren’t governments limited in their spending by what they can raise in taxation plus the amount the private sector is willing to lend them? Categorically no! A country like the UK which issues its own floating currency, does not depend on anyone else for money. It can issue more currency at will and without limit. Therefore, it can never go run out of money and can always afford to purchase anything for sale in its own currency. This is a very simple (and perhaps obvious) point, but one that is generally ignored in all discussions about government finances. When it is discussed, it is discussed in somewhat hysterical terms: “PRINTING MONEY!! HYPERINFLATION! !” etc. etc. More sensible people realise that government creation of money is no more inflationary than bank creation of money. Creation of new money could be inflationary, but only at the point where output is unable to expand any more in response to new demand. But if a government doesn’t need to collect taxes or borrow from the markets in order to spend, why does it do these things? In a country like the UK, taxes serve a number of purposes. Firstly, tax ensures there is a demand for the government’s currency. We must all pay taxes in pounds (some more than others), so we accept pounds as payment for goods and services so we can pay our taxes. Secondly, taxes make room for government spending. If the government just spent without taxing, very quickly we would reach maximum output and start to experience accelerating inflation. Taxation helps keep a lid on inflation. Finally, taxation is used to meet social aims. These may be to redistribute wealth or to discourage harmful activities, like polluting or smoking. Why does the government sell bonds? It does this primarily to maintain its target rate of interest. If the government wanted, it could stop selling bonds altogether. This would mean the overnight interest rate would fall to 0%. Bonds also serve as a risk free asset which institutions like pension funds like to hold as part of their portfolios, so they serve a purpose in that way also. So armed with this knowledge about government finances, what should government do? The do nothing approach. Like Paul Samuelson says, we can accept the truth about government finances, but also be concerned about letting governments spend without constraint, and so continue to tie our hands with regards to policy options. Taking this approach means we are in for a prolonged slump and a very slow recovery. We could still borrow more from the markets for investment, but this adds no new money to the system, just brings old money back into use. The government should ensure there is sufficient aggregate demand to ensure there is full employment. It should do this by lowering taxes and/or raising spending. If inflation beckons, government should do the opposite. Government should borrow money when it wishes to raise the interest rate and repay debt when it wishes to lower it. The government press shall print any money that may be needed to carry out rules 1 and 2. I prefer option 2 as clearly it offers the shortest path back to prosperity. There are issues around how our political system would cope with functional finance, but this is a political problem, not an economic one. If the general public were fully aware of the realities of our monetary system, and the policy options that presented, we could all have a much more grown up debate about which course we should take.